As a little pig, your dearest wish is to build a strong and beautiful house in which you can spend your long winter evenings. But you won't need trowels nor scaffoldings, as only dice will allow you to construct your dream home. Beware the wolf prowling around, whose only thought is to literally blow down your comfy house! 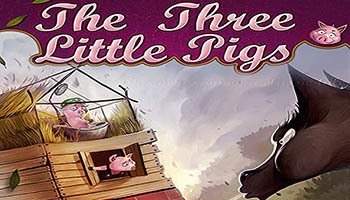 The Three Little Pigs is an easy and fun dice game for the whole family. On your turn, roll the special pink dice up to three times and try to generate symbols to trade for doors, windows, and roofs made of straw, wood, and brick. The more beautiful and voluminous your house is, the more points you will earn at the end of the game. If you generate two wolf symbols, take a huff and puff and blow someone's house down! This original game comes in a box decorated to look like a storybook and includes an illustrated version of the famous tale of the Three Little Pigs. As a little pig, your greatest desire is to build a strong and beautiful house where you can pass long winter evenings. To do this, you won't need a trowel or scaffolding, because you can simply use the dice to build your dreamhouse. But beware: The wolf is prowling, and has only one thing on his mind: Blowing down your beautiful building! 36 House tiles ( 1 ) comprising 12 straw, 12 wood, and 12 brick. Each building material has 4 door, 4 window, and 4 roof tiles. 5 special dice ( 2 ), 3 of which include one Wolf face. 1 Breath spinner ( 3 ). 6 Award cards used in the variant (see end of rulebook).